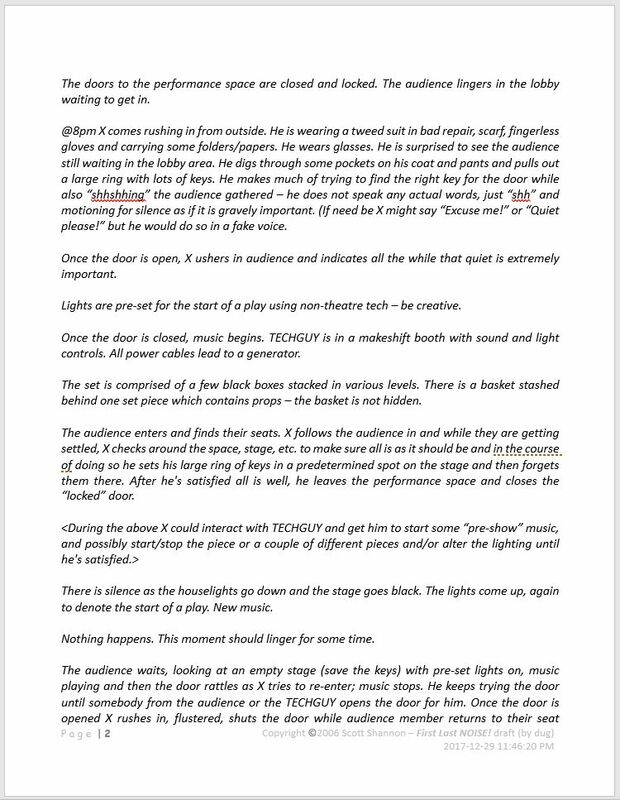 First Last Noise | Nasty Shadows Theatre Co.
As I read through the notes, it’s interesting this piece has gone full cycle from a one-man show > an ensemble piece > one-man show. I was struggling with the initial incarnation beyond my opening idea, but the ensemble version of the play led me in a more solid direction and coupled nicely with some other stuff that all takes place in the same world, while not being pre/sequels, just related stories. I had, in some sense, a full story developed for the ensemble version but unfortunately it just became to hard to get that many folks together for the time I needed – we almost did it in late/early 2014/15 but it never cam together. Nonetheless, that story became the backdrop for a few different pieces I’m developing, and A STORY JONES which we’ve just wrapped up in first complete draft. 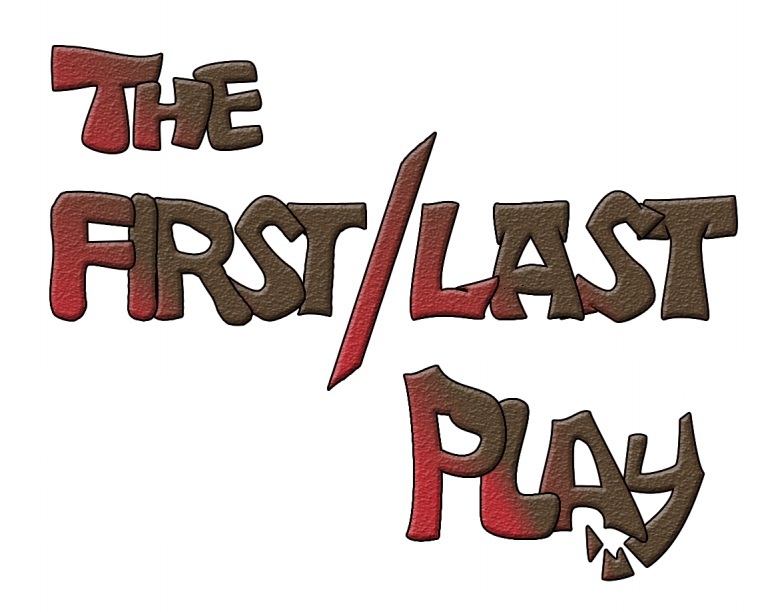 NEW TITLE = FIRST LAST NOISE! The nugget of this play began back in 2006, and before I discovered the Daniel MacIvor and his solo work, which Nasty Shadows has since poured a great deal of time into staging in years past. I’m keen to remount one or two of the MacIvor solo shows we did, but I’d like to have my own solo show staged before I go back to Daniel’s work – if anything it’s an incentive for me to focus on my creation so I can then play in MacIvor’s world, which I do so enjoy. So, in some sense I was sidetracked by how amazing MacIvor’s solo plays were, how they stood as whole plays, complete stories, and not simply autobiographical ramblings or stand-up, not that either of those forms can’t be interesting, but I at the time I was tired of them and MacIvor’s work was a breath of fresh air. The solo piece I’m creating takes a cue from MacIvor in so far as I’m making a full play, a complete story, but the world my writing creates isn’t nearly as inviting and awe-inspiring as Daniel’s. I think I’m onto something interesting, and the feel echoes other pieces I’ve developed, including A STORY JONES and THE TABLE EXPERIMENTS, but I lean towards a darker space than MacIvor creates … and I’m certainly not as skilled with words. The vibe of my plays’ worlds feels more like an attempt at Becket mixed with Shepard, my two Sams, but trying to harness some of the wonder and fun of MacIvor, all while hopefully creating something unique to me … but I’ve spent the past 10-20-30 years reading and re-reading and staging the works of those playwrights, my favourites, so it makes sense to me that what I’m writing feels like them … at least to me. I’m liking what is happening so I’m working towards sharing it with audiences … hoping to push this work forward over the coming months … Nasty Shadows celebrates 20 YEARS of making theatre in 2018, and I’d love for a new work to hit the stage in celebration of that time. And work continues on this play. I’ve got a real good shape to it now, but I’m still flushing out a few angles and broadening some characters. I like what’s happened with this … very different from where I started and what I imagined … actually, this was originally a one-man show that I began working on back in ’05-’06 (before my introduction to MacIvor — this play had already changed into a multi-character piece by then). I had to decide on a title as it was time to start spreading word about our upcoming season, and while I loved the idiosyncratic nature of my original title, I feel the new title better suits the work now as it’s evolved at this point. I continue to toy with the script, and will hopefully squeeze in a read with the actors in the coming month, but our NEW PLAN is to now stage my show in the spring of 2015 due to some actor availability, and instead we will be revisiting an old favourite of mine this fall … and this return to familiar territory has plenty of new ground to offer in the Shadow of a friend who once played along side me whilst we toiled with that Rougher Magic. Hiatus has been lifted as I actively begin work again on a play I’ve had kicking around since 2006 … hoping this coming year yields better results for me, and in turn creates a unique and exciting show for the Shadows. Very pleased with the opening 3-4 pages, but after that I’m not so happy … I’m aimlessly shooting around for what I think should be the drive of the story, but I’ve got too many ideas about what that could/should be at this point, so I need to focus down on where this story wants to go, not where I might necessarily want it to go … I mean, sure, I’m driving but the roads only go in certain directions so I need to follow those paths for this to really work.